I find myself conflicted about Destiny 2. It’s not that I have any doubts about the game, you understand. Having played it a bunch of times now, in many different ways, I have every faith that it’s going to be the streamlined, refreshed, amplified, and entirely reinvigorated sequel that Bungie’s outstanding MMOFPS both needs and deserves. 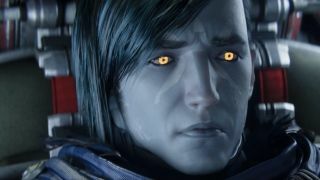 The quality of Destiny 2 is not currently in debate. But I remain ambivalent. And the thing that’s giving me a problem with Destiny 2’s imminence is the fact it inevitably means that I soon have to stop playing Destiny. And I don’t feel quite ready to do so yet. There’s no objective, completion-based reason for it. I’ve been playing Destiny solidly since day one, and theoretically I’ve played ‘enough’. I hit the Light level cap some time ago, have achieved pretty much everything I want to achieve, and for the last few months I’ve really just been pottering around, messing about with friends, and smashing people up on Crucible maps I now know like the inside of my own eyelids. I should be bored. I should be ready to move on. I should be counting down the days until I can uninstall the tired old first game to make way for the new one. But that would only be the case if Destiny was a normal game, and it isn’t. Destiny isn’t simply a series of missions and challenges to be completed, ticked off, and left behind. Destiny is more of a place, and it’s one that I’m really attached to. This isn’t merely Stockholm syndrome talking, the fevered, institutionalised symptom of a fearful mind so hooked to the loot-grind as to be unable to function in the outside world. Rather it all kind of comes down to the way we relate to places in the real world. There’s a big difference between a house and a home. The former can be grandiose, and beautifully constructed, and an enjoyable place to explore for a while, but that doesn’t necessarily mean you’re going to want to stick around for more than a day. It’s only through the long-term addition of warm, consistent human factors that a building gains the kind of emotional resonance that makes it more than bricks and mortar. In exactly the same way, Destiny has become far more than a video game over the last three years. The particular human factor that has achieved this over the last 36 Earth-months has resulted from a unique blend of encouraging game systems and uncommonly nourishing community. Both are all-too rare in the field of online shooters, an area traditionally dominated by demanding - and rapidly accelerating - skill requirements, and an emphasis on competition over collaboration. But by building Destiny as a journey of personal growth and development before all else – and ensuring that every activity, even its own PvP element, is defined by that journey by way of XP and loot drops – Bungie created a game world without the usual dog-eat-dog philosophy. Instead it’s wrapped around an all-pervading attitude of ‘We’re all in this together’. As such, Destiny attracted a particular sort of player. And those players rapidly formed into a community of benevolent, helpful, supportive explorers, each on his or her own forward path, but inalienably aware that everyone they met along the way was on the very same one, enjoying the same highs and battling the same challenges. For all the repetition and remixing of content, Destiny has never been a static or repetitive experience. The personal journey each Guardian has cut through the replay of its Strikes, Raids, and PvP modes has been an ever-onward march of strength, skill, experience, and ability, each loot drop and learned insight slightly evolving – much like in real life – their perception of their surroundings, themselves, and each other. Suddenly, the family home had a far-flung but deeply connected family helping each other grow, and that immediately started to change the way it felt. Those Patrol maps, Strike levels, and Raid boss rooms stopped being mere pieces of video game architecture, and turned into the settings of multifarious communal victories, defeats, and personal turning points. Much like the rooms in a home, certain spots became forever landmarked with important, shared moments. The Public Event spawn points, which rapidly coalesced into impromptu meeting areas as we all got the hang of the events’ start timings. Energised spots of countryside that would steadily fill with eager, dedicated Guardians as the moment drew close, like the site of a concert or festival in the hours before its start. And the farming spots, suitable for different challenges and quest-steps, where we discovered particularly abundant, fast-respawning pockets of desired enemy types – or in the early days, guaranteed circuits of treasure chests, ripe with Spinmetal and Helium Filaments – with which to power up our weapons and move closer to the next one. Even in these innocuous moments, Destiny cemented a wonderful, unspoken camaraderie, as Guardians gathered through shared purpose, recognising each other’s needs through their sheer presence, and instinctively working together toward a communal goal. That unknown pick-up player you and your friend were buddied with in Strike match-making? You’d always give him a chance. However different, goofy, or haphazard his play-style, you’d always be inclined to think well of him, and help him out, and build your strategies around his play, rather than leave him to lone-wolf it. Because he could just as easily have been that Guardian you saw out in the Plaguelands days earlier, waving at the entrance to the Archon’s Forge, trying to get a team together in order to take on the arena’s challenges. He could have been the Guardian who came along to help you when you were doing similar a couple of weeks before. That one Guardian in the Crucible who kept drilling you with dirty Gjallarhorn shots, or languished eternal in the pits of your own team’s score table? Who’s to say he wasn’t one of the giddy crowd you grouped together with to crush that diamond-hard Taken invasion on Venus, after days of solo failure? Or that his cheesy, Wolfpack overkill wasn’t just a deservedly ebullient celebration after weeks of fighting for a long-coveted treasure, just as you had done with Truth or Invective? Regardless of its physical structure, and special events, and ever-expanding array of loot opportunities, the form and fabric of Destiny has always been made of this sort of empathy, this texture of shared experience. And all of those explicit, in-game components have been imprinted with the underlying human connections they fuel. They’ve been defined – like the woods you played in as a kid, or the bar you first got drunk in – all the more tangibly by them. And it hasn’t remained in-game. Because of course it hasn’t. Experiences this potent never remain in the location of their initial occurrence. Their influence spreads. There are obvious cases, like the wonderful charity work done by the Destiny community, or the long-standing Sherpa programme, whereby experienced Guardians will volunteer their skills and knowledge to guide new and solo players through tougher challenges. But there are the smaller, less obvious things as well, the things that are just as important in their own way, and similarly born out of the connections we found in the Cosmodrome. Of course, there are the friendships, countless real-world relationships having grown from initially wordless Guardian collaborations. Over the last three years my PSN contacts have ballooned, almost exclusively through Destiny. I’m closer to cool people I only slightly knew before. I’ve built and maintained legitimate friendships with people I first met in-game, some of whom I’ve only ever seen as their Guardians. Our only ‘physical’ interactions might involve gun fights and space magic, but our shared memories are just as real as any other. One friend even recently told me that the benevolent, shared purpose of the Destiny community helped him get over his social anxiety, to the point that he could finally link up with a party of strangers who’d invited him in-game, confident that things would work out. When I asked if it was okay to mention that story in this article, he agreed without pause, telling me “Destiny has treated me really well… I'm happy to pay it forward”. I’ve found that the fastest way to connect with new people if there are gamers in the room (particularly handy at work events outside the office) is to bring up Destiny straight away. Two inevitable minutes of impassioned talk about class builds and recent experiences later, and you’ll be bonded forevermore. And all of these conversations, whether they happen over a mic or in a restaurant, refer back, as their anchor-point, to things we’ve seen and done in Old Russia, on the Moon, on Mars, Venus, or Mercury. The effects of these relationships might be multifarious and wide-ranging, but they all started in-game. And therefore, they all colour and reshape the game world itself. So when I think back to Destiny, as I often will, I won’t think so much of specific runs at specific boss fights, or loot-plundering do-overs of Raids. I’ll think of the conversations I’ve had while turning that corner into the Forgotten Shore, or while debating whether to stop and shoot down that handful of Dregs near the entrance to Dock 13. I’ll think of the long evenings burning gleefully through the Strike playlist when too excited about something to settle down, or the nights spent humming around the ambient expanse of the Plaguelands on my Sparrow, using the pleasant rhythm of Patrol missions and Public Event assists to quell useless thoughts of a stressful thing. I’ll think about that Control match, where all but one of the opposing team bailed out early on, and the lone, remaining Guardian battled on until the last moment, refusing to give up, regardless of the 6-1 odds. My team stopped for a dance party halfway through that one, but quickly broke away as soon as our plucky opponent started scoring again. I sent that guy a message of congratulation and respect afterward. He’s on my Friends List now. And most of all, I’ll think about every single other Guardian I met along the way, whether in the open ground of public areas, or doing congas and kicking footballs in the Tower, or partnered up in Strikes, or appearing as a strong ally or staunch rival in the Crucible. I’ll think of how every one of those actions informed and coloured every one one of those places, and made it more real. They all made Destiny what it is. Or rather, as I’m rapidly realising with no small mix of strange feelings, what it was. I’m quickly aware that there’s now a finite and ever-dwindling number of times I’m going to go to those places, and see those things. An ever decreasing future tally of Sparrow drive-bys past the Vault of Glass, or leaps into the Sunless Cell’s final pit. I don’t know when the count will hit zero – and I almost definitely won’t realise when it happens - but it’s going to be soon. There was a time that felt impossible, but it was clearly always inevitable. The difference between the two was just a matter of perspective from different parts of the journey. Leaving Destiny behind feels a lot like leaving home for the first time. The formative experiences that happened there will be carried forward with us, of course, and will inform every moment of our journeys ahead into Destiny 2. And those journeys will be all the better, and more fun, and more potent because of them. It will be sad to walk away, whenever we acknowledge that we have done just that, and going back will become impossible the very same instant. A place is always smaller when you go back. Smaller and missing something, because the something is you. But it will be okay. Forward is where the future happens, whereas the past is a limited ‘greatest hits’ album played on a loop. And going forward, together, has been what Destiny has always been about. And it is, after all, exactly what got us to where we are now. You can trust forward. Forward always works out.